I am a self taught metalsmith and I make Copper Things. It started as a hobby in 2008, making wire jewellery and polishing rocks to sell at local craft shows and via my website. 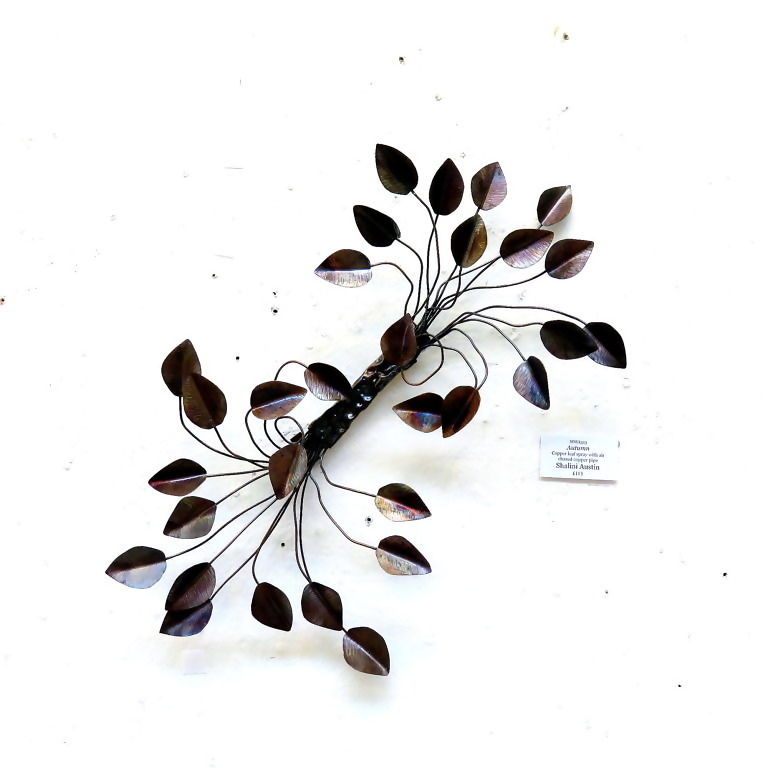 As I progressed on my creative journey I learnt to appreciate sheet metal, especially copper. So it is only natural that my work is now taking a new path in coppersmithing. 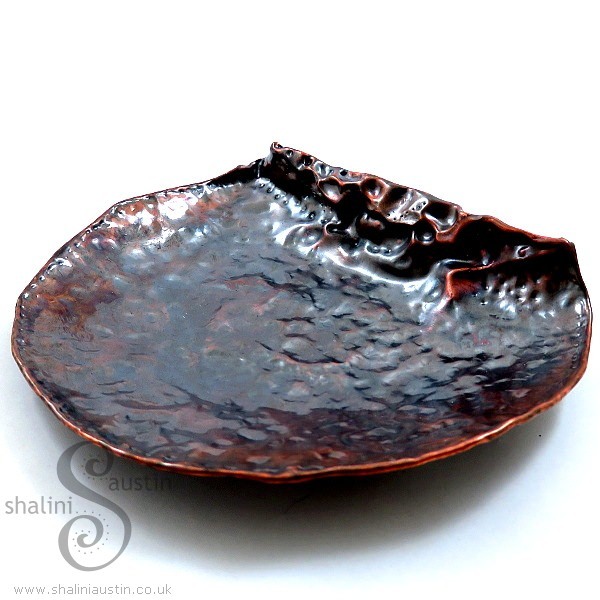 Since 2014 I have been working mainly with sheet copper, crafting a decorative and functional range of copper jewellery, home-ware and sculptures. 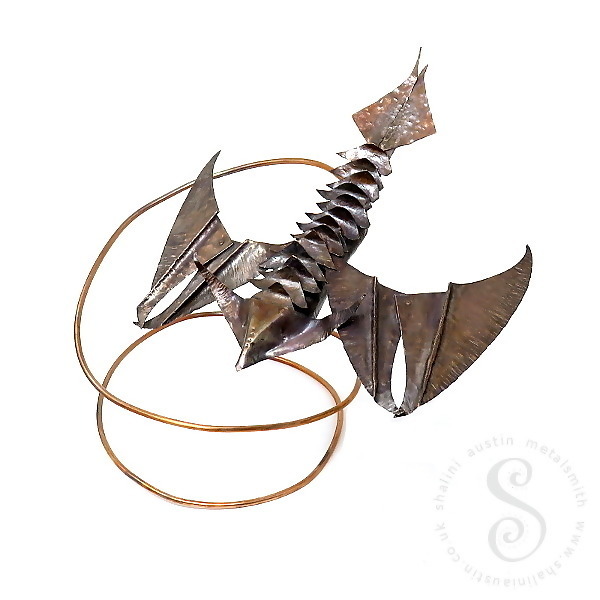 I love working with sheet metal and creating interesting 3D forms and shapes, often using nothing more than a simple hammer to create textures. Hand forged round copper bowl. The ruffled edges of this bowl make it look like a flower. I am really pleased that I was able to achieve this result and look on my very first attempt at making a deep bowl in this style. 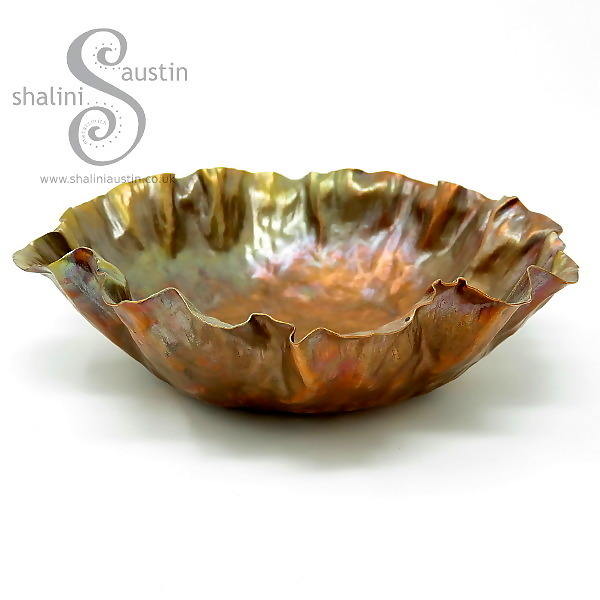 I have made small copper trays with ruffled edges before but not a deeper bowl like this one. 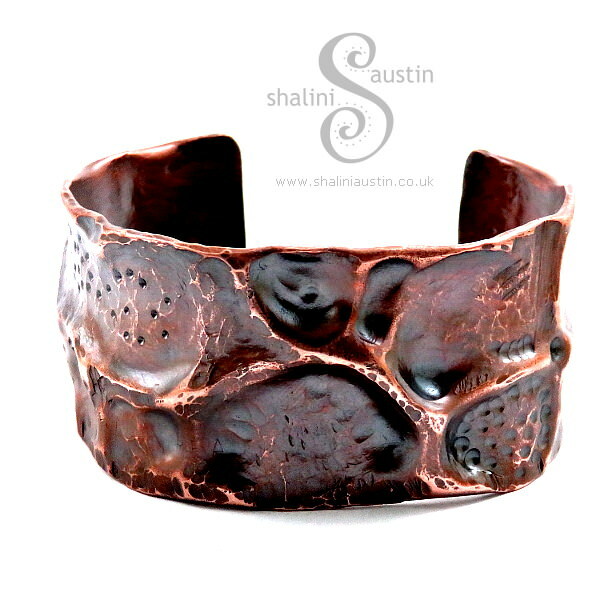 Individually hand forged copper cuff from recycled copper pipe. I use a variety of texturing and air chasing techniques to create these cuffs, each piece is organic, bold and a one off. Wearable Copper art cuff, cut individually from copper sheet and designed using a technique called fold forming which involves a lot of annealing and lots of hammering. This is a wide Cuff. Width is 5 cm and it is a standard fit at approximately 6.5 inches. I wanted to create a functional piece of art and used a variety of hammers and dapping tools to make this potpourri tray. Air Chasing is slowly becoming a favourite fabrication technique and I used it once again to create this tray. The folds and bumps and dips in the metal remind me of the lunar landscape of Ladakh, India. I travelled in the area in 1999-2000 and is a place I would love to visit again. I love making leaves and make a lot of leaf earrings, small leaf sprays and fold formed single leaves which have been popular at the artists market and shops I sell at. For my 2016 Stamford Arts Centre exhibition I created this bigger leaf spray. This piece has been given a liver of sulphur patina and in parts flame patina too because I wanted to bring out autumn colours. 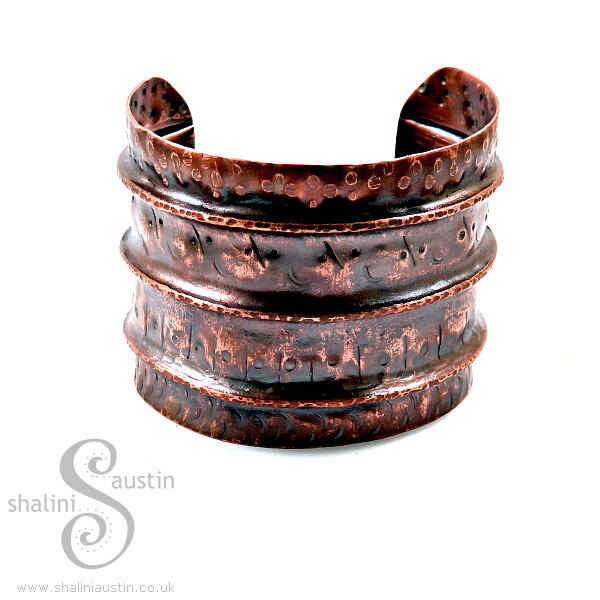 I wanted to take my Air-chasing skills a step further from small items of jewellery to create something bold which would bring out the natural beauty of hammered copper. 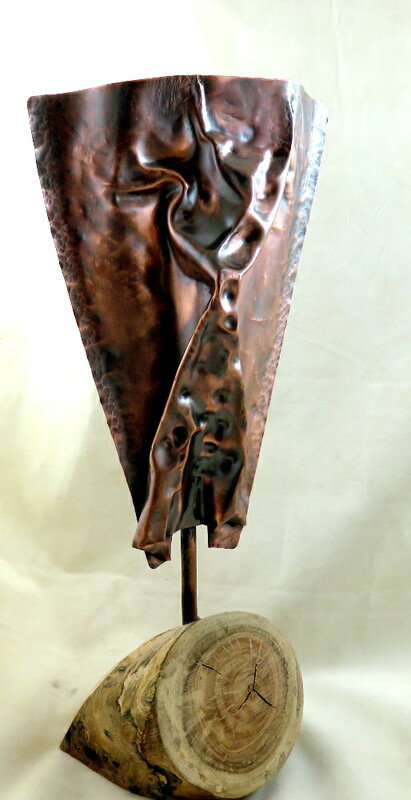 The uniqueness of each sculpted piece, once the folds are opened and cleaned up is a joy!